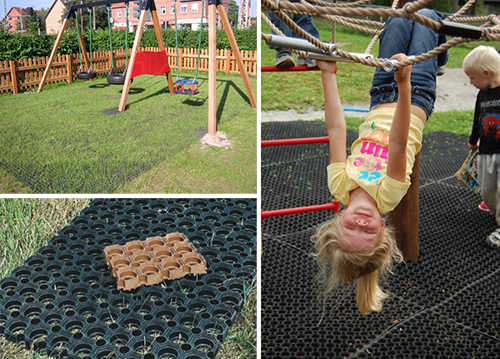 Rubber Mats for Playgrounds are a fantastic product which can be used in a play area where it’s important to have a natural theme. A lot of forest parks prefer to use this type of product to keep it in tune with nature. Rubber Safety Mats are a fabulous, affordable alternative to wetpour especially in a project where price maybe an issue. Rubber Mats can be installed on loose surfaces like sand or gravel. The holes allow the grass to grow up through the mats and thereby create a green area. Rubber tiles are produced from coloured rubber granulate with grain size of 1-3 mm, connected with polyurethane glue. The combination of these components produces a safety surface with high impact absorption properties. Our Rubber mats meet the requirements of EN 1177. 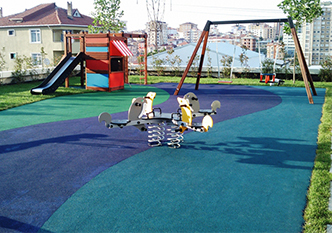 Rubber tiles can be laid on tarmac, concrete or any other type of stabilized base and joined together with a system of connectors. 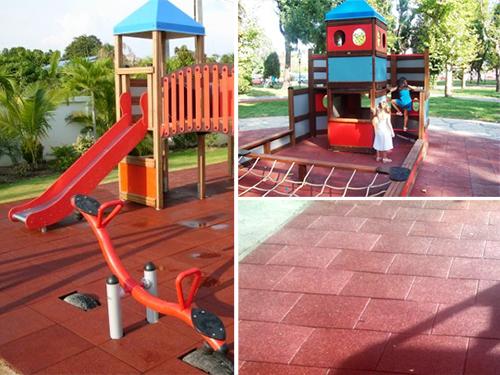 Rubber tiles are available in a variety of colours : red-brown, green, blue, grey. Lars Play offer a huge variety of colours and images in the Wetpour surfacing. We can create a magical experience to capture any child’s imagination by creating a theme in the wetpour. Whether its maritime theme, jungle theme etc, the use of fantastic crafted images can expand and excite any child’s imagination. 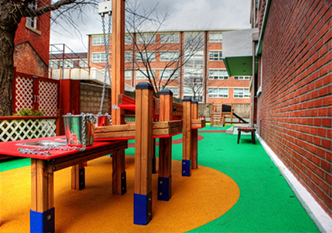 With our experienced team of safety surface installers we can meet all your needs. Wetpour is one of the most popular and durable surfaces for indoor and outdoor use. It can be installed directly onto hard surfaces like tarmac with ramped edges. 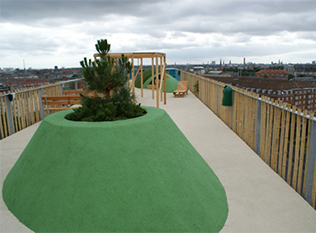 Lars Play is able to supply wetpour surfaces in a variety of colours according to our customers requirements. Wetpour consists of two layers: Bottom layer made of black SBR granulate and top layer made of coloured rubber EPDM granulate. The task of the bottom layer is to absorb the impact. The top layer is UV resistant and its task is to protect the bottom layer against wear.